Although a newer vintage than the 2009, it's still like going back in time. The coolest thing about this blog having been around awhile, other than the fact that I’ve miraculously managed to regularly publish an Internet wine blog for the better part of a year, is that I’m starting to come across second vintages in the bottles I open: current vintage wines whose predecessors I have previously featured on PnP. Case in point: the 2010 Painted Rock Chardonnay from the Okanagan Valley, which is probably already facing an uphill battle in this review due to monstrously high expectations because I totally loved the 2009 PR Chard back in September. 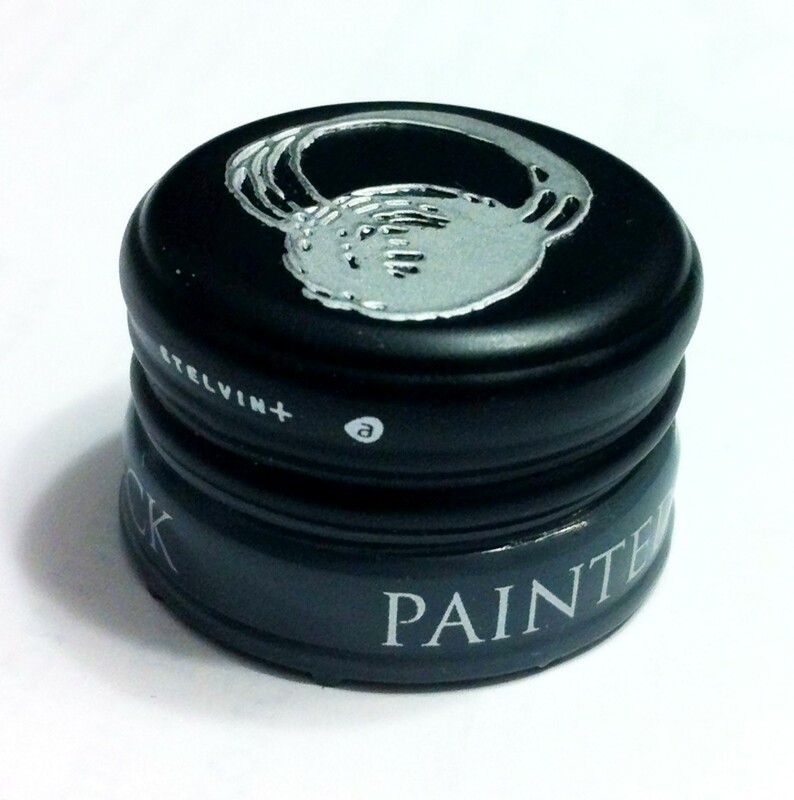 I think Painted Rock is a producer on the forefront of the Canadian wine scene, one that is starting to show that we don’t have to settle for local wines that only measure up as against their neighbours, but that can also stand tall on the international market. While PR focuses primarily on red wine, their lone white is a testament to the wonders of cool-climate Chardonnay, and I thought enough about the ’09 vintage that I absolutely loaded up on the 2010 as soon as it became available. While there was some change in packaging from one year to the next — Painted Rock has gone from cork to (a totally gorgeous rock star) screwcap for its Chard and has dramatically lightened its previously-pimped-out bottle — much of the style of the 2010 wine was quite consistent with 2009. 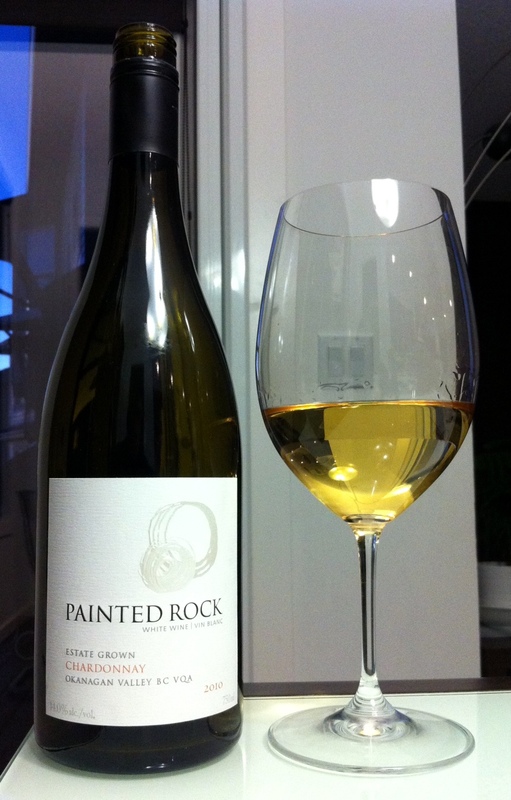 The 2010 Painted Rock almost seemed like an embryonic ’09, not yet to the point where the parts had fully coalesced into the whole, but promising big things to come. Despite little aging time, the Chardonnay was still a brilliant medium gold colour in the glass, the depth of colour echoing both the varietal and the 4½ months the wine spent aging in new French oak barrels before bottling (oak aging tends to deepen the colour of a white wine). Oak-induced sweet (vanilla and marshmallow) and toasty (smoke and, well, toast) notes were the first prominent aromas that jumped out on the nose, sitting on top of ripe fruit, from apple to pineapple to cantaloupe, and an underlying mineral streak. While this was not a tremendously unusual nose for a wine from this wine, on the first sip the PR really started to stand out from its Chardonnay brethren. The body of the PR is full but never languid, because just as you start to taste it you’re immediately hit with a violent rush of energy stemming from the wine’s piercing, untamed acidity. Unlike many Chardonnay producers, Painted Rock does not subject its Chard to malolactic fermentation, which is a bacterial process that converts the harsher, sharper malic acid in a wine (think Granny Smith apple acid) to smoother, softer lactic acid (think milk or yogourt acid). If you ever wondered why many Chardonnays seem lush and buttery while Sauvignon Blancs or Rieslings are taut and crisp, at least some of the answer comes from the fact that the latter two grapes never get malolactic treatment, while Chardonnay commonly sees it. But not this one. As a result, the grape’s inherent acid, sharpened by the relatively cooler climate, provides a remarkable racy structure to the wine. This acid brings the whole palate alive and deemphasizes the oaky notes from the nose, leading to a slightly more austere flavour profile of green apple, citrus, mango, coconut and green grass, all orbiting a searing stony/steely streak that cuts right down the middle of the tongue. I am a Painted Rock convert, but to me, this bottle hasn’t fully come together yet: all of the ingredients for a star wine are sitting there, but it needs a little more baking time for everything to integrate together. The main thing about the 2009 Chard that I’m not yet getting in the 2010 is that the components of the ’09 all seemed harmonious and cohesive. With this bottle, the acid stands out, and the oak treatment stands out, and the lush fruit stands out, but each separately. Luckily, one thing that can start to glue these elements together is bottle age, something that I think will help this wine quite a bit. I have a couple bottles still left, so I’ll check back in a year or so and see if I’m right. Regardless, the very fact that I’m making this guess is a prime indicator of the quality of this Chardonnay — I can’t think of too many other Canadian whites that I feel need some extra time in the bottle to truly show themselves. I’ll be back for the 2011 vintage!